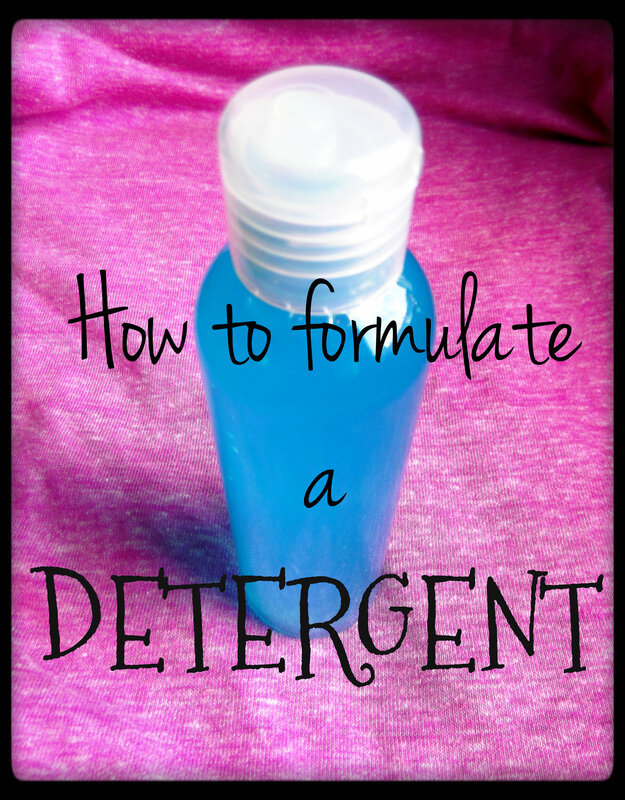 Now we know the basics about our surfactants (if you haven’t read the previous post, go HERE) now it is time to actually formulate a detergent. There are not totally wrong combinations of surfactants: you can mix them just by chance and eventually you will always get a detergent, whatever you do. What could go wrong is that you might get a very liquid detergent or you might get it more aggressive than you expected, but it will still be a detergent! However there are some rules that, if followed, will give you a good detergent with a good density and the right washing-ability. So far what we said is that mixing more surfactants will eventually give us a less harsh detergent (of course than a detergent made with a single surfactant keeping the active matter value stable). – an anionic or non-ionic surfactant; it is the surfactant which we will add in our detergent at higher %. – an amphoteric surfactant; it will make the first surfactant more mild. – extra surfactants: (usually non-ionic) these are used in very low percentage and are added to improve the lather or the consistency of the detergent. Making this kind of combination of surfactants will give, as a result, a balanced detergent which will be delicate enough (this is of course also related to the active matter %). Always as a matter of delicacy, if you add certain substances, they act as a protector to your skin (for example proteins, at 1-2%). You could also think of superfatting your detergent and this low percentage of oil will “use” some of the surfactants making your detergent more mild on the skin. Notice, however, that some surfactants don’t “bear” the presence of oils (even an extra drop of perfume oil can disturb them) and get liquid immediately after you add them to the mixture (for example it is the case of sodium lauroyl sarcosinate). The viscosity of your product is very important: a water-like detergent gives to our subconscious the feeling that it cannot clean enough (even if it is not so). The negative thing is that some surfactants, when combined, give a very liquid result. – SLES + betaine (an amphoteric surfactant) + salt = very dense detergent. Sodium chloride (salt) is often in commercial detergents, even in shampoos. However if you add too much it can make your detergent too harsh. In my shampoo I use SLES, cocamidopropyl betaine and I never needed to add salt because it was dense enough (sometimes even too much). – SLS + a glucoside (this means a non-ionic surfactant: lauryl glucoside, decyl glucoside are the most common for example). if you have already tried the recipe and you like the result as detergent but it is too liquid, the next time you repeat the recipe you can add xanthan gum to the water of the detergent in order to thicken it up a little bit. However do not use xanthan gum at more than 1% or the detergent will get an unpleasant slimy feeling. There are also some synthetic thickeners exactly made for surfactants. The best one so far is Tinovis GTC (Inci: Acrylates / Beheneth-25 Methacrylate Copolymer) because you can add it at the end of the making of your detergent and therefore you can adjust the density little by little. Also the formulation of a detergent is divided in Phase A, B and usually C.
this will be our water phase and usually it contains water and glycerin (remember glycerin is important to keep our products hydrated, this is because glycerin is highly hydrophilic). In case you want to add xanthan gum you have to add it now (also some synthetic thickeners have to be added in beginning so be sure to read the data sheet of your raw material in advance! 🙂 ). You also add here any hydrophilic ingredient: for example you add your preservative (ONLY in case it is hydrophilic of course), your hydrophilic colorant (for example the food grade ones), and so on. In our phase B we have most of the surfactants: usually we add the surfactant at higher percentage (which is usually an anionic surfactant) and one by one we add the “extra surfactants” which are usually the non-ionic ones. IMPORTANT: do not add now the amphoteric surfactants (generally the betaine) or your detergent might get ruined (in the way it gets very liquid… once again: a detergent cannot really get spoiled and it will still clean your body even if you do something wrong). Often I add the perfume and the lipophilic preservative directly here in the mixture of surfactants (of course in case I am not using already an hydrophilic one). One important thing to notice is that once you add a surfactant to another you are supposed to mix slowly and combine them very well because you add a third one. Now it is time to pour Phase A slowly into Phase B and mix. This time we only use a spoon to mix, paying attention to not make too many bubbles (however even if you get too many bubbles, they will disappear with time). This is the phase where you add the amphoteric surfactant and usually your detergent gets thick here. Thank you for all this research and information ! I was wandering is one can use baking soda (sodium hydrogen carbonate, NAHCO3) as an amphoteric surfactant ? In that case, if I have pure sodium hydrogen carbonate, all of it would be active surfactant matter, wouldn’t it ? Hi I was wondering what using boiled soap nuts would be considered. Or would it be able to replace one of the surfactants? I am not a big fan of soap nuts to be honest. Yes they seem to produce something like a surfactant but you cannot know the concentration and the “washing ability” and so on. So this is already a big problem for formulating because in order to formulate a good detergent, you need these infos. Also, there will be another problem when talking about preserving the detergent: if you boil these nuts, you are actually going to have a lot of organic matter to deal with in your solution. Organic matter means good food for bacteria… which leads to infested detergent. You might end up needing to use a very high % of preservative, de facto spoiling your intention of having a “more natural” detergent. Thing is: there are many many many surfactants that you can purchase online which are certified to be of natural origin, work much better than soap nuts, have better qualities (like wetting ability for example), you know what you are using… and so on. First off I love your site and your YouTube channel…Secondly what If i don’t want to add cocamidoprpyl betaine in my detergent…I’m not really interested in the lather just the cleaning ability. Will leaving that out alter the consistency or effectiveness of the detergent? What are just as hydrophilic replacements for glycerin? I WANT JAUST THANK YOU FOR YOUR INFORMATION ,an d i have one quation about the paste dish wishing if you have any idea N??? I don’t know what is “paste dish wishing” but if it is (I guess) some detergent for washing the dishes, I can say nothing because I have only formulated cosmetics and not products for cleaning the household and so on. I really don’t know anything about that. Y we cannot mix anionic and amphoteric together? Yes you can: SLES is anionic, CAPB is amphoteric and this is a very common combination! It is anionic and cationic that usually aren’t mixed, and it is basically because of their opposed charge. Main characteristic of amphoteric surfactants is their dependence on the pH of the solution in which they are dissolved. In acid solution the molecule acquires a positive charge and behaves like a cationic surfactant. In alkaline solution they become negatively charged and behave like an anionic surfactant. But why won’t you just use another polymer that works better? Hi,thancs for this useful article. I have some questions.First, why does adding secondary surfactant decrease viscosity especialy when we use a polymer thikener,and may the salt to harm to another indregents ,for example chlorhexidine? Hei Miroslav, I am not sure I understood: in the article I state that adding a secondary surfactant sometimes increases the viscosity (but it depends on the surfactants). If you add a thickener, that would increase the viscosity as well but, of course, it depends on the polymer: carbopol ultrez 21 hate salts so it wouldn’t work. But if you add a polymer which is made for working with surfactants, then it obviously works. Hi,Sorry I didn’t explain well. I make viskosity solution by mixing “Ammonyx MO” (myristyl dimethyl amine oxide) that’s my primary surfactant and Cocobetain my secondary one.In the end I add thikener “Glukamat LM” (methyl glucose ether).When I put those indregents in this order 1Ammonyx;2 Betain; 3 Thikener, I have viskosity liquid soap,but when I change the order and put first betain the viskosity doesn’t increase after puting the thikener. Yes, it can happen. That’s why I tend to add betaine at the end: sometimes it does work like this with surfactants and you need to add ingredients in a specific order. I have never used that primary surfactant nor this specific thickener, so I cannot know for sure, but have you checked the instructions of the thickener? Cause they might request for it to be added at the beginning, to water alone! This is the case for Carbopol Aqua, for example: it must be added at the very beginning or it doesn’t thicken at all. I just like to ask about “sodium lauroyl sarcosinate + pH 5”, at which phase can I add citric acid? Is it at the start along Phase A? or during Phase C? You add it in the very end, a very small amount at the time, to be sure you don’t get too low! Hello, my name is TANESHA, i really need your help in this natural anti-dandruff shampoo formulation. The thickener i used in this formulation is sodium cmc of 1.3 % by weight. After 6 months, the shampoo became unstable as it is natural thickener, it became more thicker than it should be. now, what can i do to stabilize the shampoo? please help. This is natural shampoo, thus i cant add synthetic ingredients. Water : Qs – 100. Under what certification is Tween 80 considered “natural”? What is the antibacterial agent you used? I have never used CMC, I don’t know if after few months it gives this kind of issue. However, this shampoo doesn’t look like a good formula to me. There are many better natural-certified surfactants that could be used in combination. I don’t think the “being too thick” is the only issue of this formula. Hi and thanks for making surfactants more understandable. I would like to make shampoo and a creamy foaming facial cleanser. I purchased some SLSA and coco betaine but realise I need to add one extra surfactant (at least). Could you suggested what might be a basic kit of surfactants that I need to develop skills in formulating detergents for skin and hair? I am a little overwhelmed by the number that are available. I am keen to learn how to calculate and use surfactants but need to get the basic ingredients first. You don’t “need” the contour surfactants. They just help in modulating the strength and so on, but you can also add a 1% of oil for example (there is a risk it separates, so add it to the mix of surfactants first and then add the water). If you buy liquid surfactants it gets even more simple as they mix quite easily. I just want to ask if banana peels is a good surfactants? Hi, which is the most mildest and effective surfactant. I found non ionic like coco glucoside etc are milder and of more natural origin. Can I use only this in my solid shampoo bar with btms. 50. Regarding preservative is grapefruit extract good enough. And can I add xantham gum powder or liquid for thickening. Also any other natural ingredients like henna, shikakai. And can it be made without heating like i have seen videos where people make without heating just mixing and pressing or mixing and freezing. Grapefruit extract is not a real preservative. Thanks for resolving the query..
Is there a need to add any detangler or more emollient after adding above ? Would highly appreciate your input.. It all depends on your hair type. Pq7 3% seems high to me but maybe it is good for your hair. Try the formula, make a small batch (100 grams) and see if you need to tweak the formula for your hair! I can start with Polyquat 7 @2% , and then if need be 3 . Should I add EDTA/ Sodium Gluconate … I have hard water where I live. Many thanks for clearing up my queries in advance. EDTA is always advisable because it also helps preservation. Thank you for this explanation on shampoos/detergents. I’ve paid for cosmetic classes, the swiftymonkey blog, i’m in makingskincare groups on fb, read published articles from chemists and no one has made as much sense as you have here. Like i swear, a freakin’ light bulb has turned on and i’m just so freakin’ thankful because shampoo is my last item to make and it’s been so so so hard. and then lastly, this post is like from what? 2015? that makes it old but look! it’s still got some really good information, info that’s still relevant! everyone raves about this swiftymonkey blog that you gotta pay for but everything is old, outdated, broken. i ask a question and get pointed to an old outdated article and have more questions because info isn’t relevant and the creator is grumpy (tbh, they are rude) with their replies even though my journey on their blog is a course set by them! the people above me are asking questions you’re answering them and you’re being nice and polite and it’s like you know we are clueless newbies desperate for learnin’ and we just need a push in the right direction. So thank you for your blog with fantastic information. thank you for having this blog and i’m sorry i didn’t find it sooner.